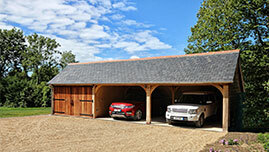 Building oak framed garages and carports across the Isle of Wight. We are the leading specialists in supplying, oak framed, traditional garages, car ports and timber outbuildings to clients on the Isle of Wight (IOW). Our classic buildings are expertly crafted using long-established joinery techniques. With decades of experience in this industry we have the expertise to deliver high quality, oak garages that are well suited to the local, rural landscape. We have exhibited at local country shows and you may have seen our barns and garages across the IOW and mainland Hampshire. We use chunky, oak timbers for all of our buildings due to its strong, reliable nature and it perfectly suits the island countryside and protected areas. With an accreditation to The Guild of Master Craftsmen you can rest assured that our build quality and the service that you receive, should exceed your expectations. As members of this Guild we can assure our clients that we utilise traditional features throughout our frames. We don’t use quick-fit joints or softwood stud work within our oak frames, instead we use detailed oak work connected with traditional joints that are finished with oak dowelling. This is just one of the many features you’ll see, inside our oak garages and timber framed outbuildings. As well as offering a range of ready to go designs we also offer a bespoke service, should you have additional requirements for your oak outbuilding. We offer a flexible service to suit the requirements of the residents of the IOW and the associated costs in bringing materials from the mainland. We provide support when it comes to any planning applications in the event that one is required. 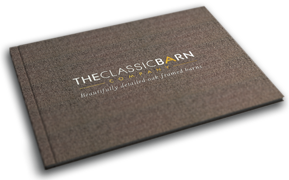 We can guide you through the process from the design stage, through to completion of your classic oak garage or barn. If you’d like to view more of our products you can find a range of images throughout our gallery. To discuss your project please get in touch with us and request a brochure. We will explore your project with you and would be happy to show you close ups of our work, as well as putting you in touch with others who have received our award winning product and service. Commissioning projects in Cowes, Ryde, Newport, Ventnor, Bembridge, Freshwater, Mottistone, Shanklin, Chale Green, Newtown, Downend, Wellow, Shorwell, Godshill, Yarmouth, Ashey and Calbourne.